Here is my first ornament. 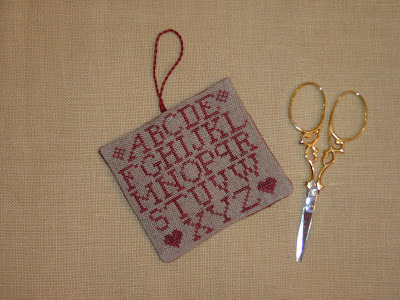 It started off being my January ornament but as I'm not a very fast stitcher it became my February one. I shall be finishing it off into an ornament at a later date. 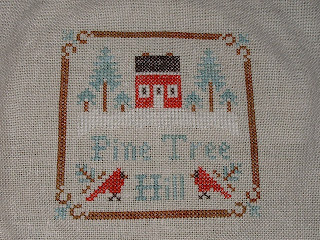 It's Pine Tree Hill by Little House Needleworks from JCS Ornament issue 2006. I substituted the red and green as I didn't have the right colours but the others are as called for, and I've stitched it on 36ct Edinburgh. Now I just have to decide which one I'm going to stitch next. 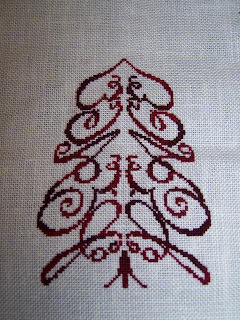 This month I managed to stitch three ornaments, but to be fair, one was started last month. I'd like to average two ornaments each month so I was happy to get an extra ornament in this month. Maybe next month I'll work on a larger ornament. I'm very fond of these smaller designs though. Everything was stitched fairly quickly. Since I substituted missing fibers with stuff on hand, this SAL is helping to justify my stash. 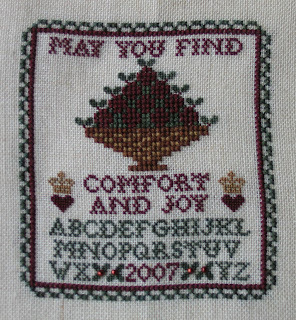 The first finish was Christmas Tree by Whiskey Creek Ink, which can be found in the 2006 JCS Ornament Issue. I did not have the recommend threads so I used DMC 75 for the red and Watercolours 89 Caribbean for the Green. 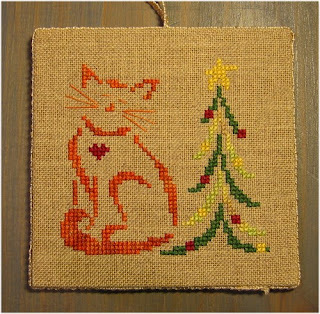 I love how it stitched and plan to make a teeny two sided pillow ornament. I also plan to stitch a darker version at a later SAL. 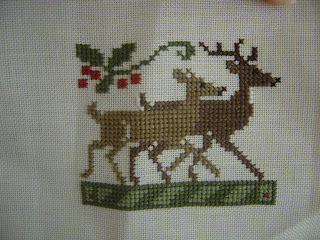 Next, I finished Red Berries by Rosewood Manor from the December 2006 Issue of Gift of Stitching. I absolutely love this design and have been admiring it from the first moment I saw it. I think I'll be greedy and keep this one for myself. Again, I didn't have the recommended fibers so I substituted with colors I had on hand. It's stitched on Queen Anne's Lace 32 count jobelan with DMC4210 and Crescent Colours Bejeweled (a gift from Charisse at the Wagon). The beads are Mill Hill 2012. There are so many lovely variations that could be stitched: Metallics for the star shapes, silver and gold beads, white berries instead.... I liked this design so much, I purchased another Rosewood Manor Ornaments chart. 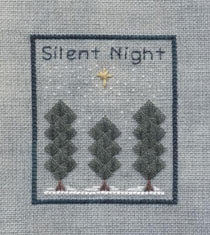 While watching the Oscars, I stitched Silent Night, a freebie by Elizabeth's Designs. The only recommended fiber used was the DMC B5200. The Star is stitched with toffee by Six Strand Sweets. 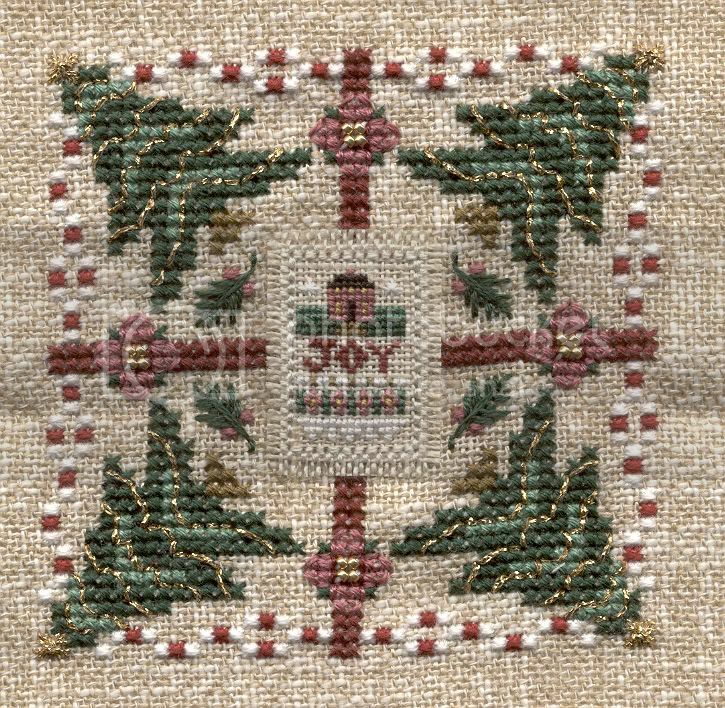 I used Espresso by Six Strand Sweets and #448 Evergreen Soy Luster Solids (thanks to a very generous Maxine at the HAED BB--I love it!) were used for the trees. I used Bejeweled again for the border and words. The fabric is Squall by Sugar Maple Fabrics in 32 count lugana. 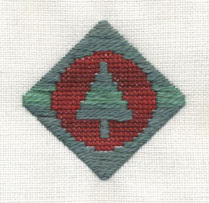 The trees were fun to stitch! I think the trickiest part of this design is the white over one stars. 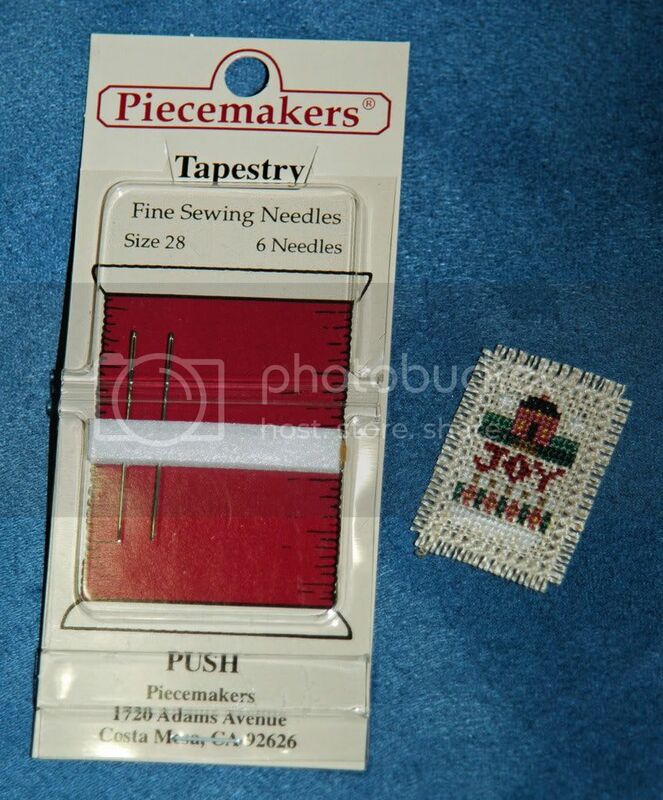 If I did it again, I think I would use the Mill Hill petite beads instead of the tiny cross stitches. All the designs are gorgeous this month. Congratulations on the beautiful stitching! Here is my effort for February! 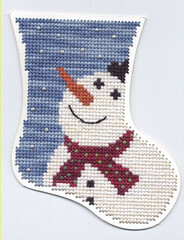 It's a freebie design for a Trinket's stocking by Tokens and Trifles. I pulled the DMC from my stash and didn't like it so I have substituted a bunch of WDW threads. I really like how it turned out - very cute indeed. First of all, let me say that everyone has been stitching some beautiful ornaments!!! 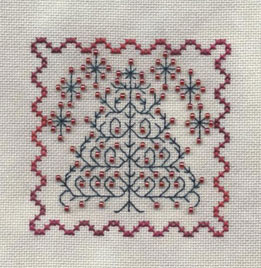 I didn't stitch an ornament in January and it looked like I was going to miss out this month, too, but yesterday I woke up with a determination to stitch a small ornament. I succeeded!! 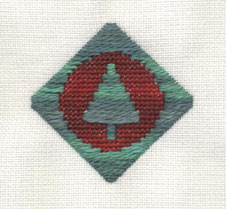 May I present "Diamond Tree", designed by Dani for a stitched design collection put together by members of the Teresa Wenztler Bulletin Board in 2003. 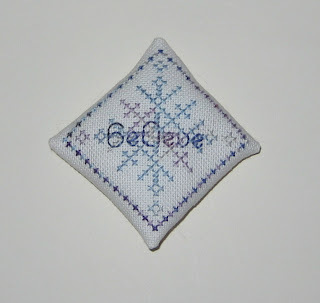 I stitched it on 28ct Platinum Cashel linen with the recommended DMC fibres. I chose to leave off the border since I wanted something fairly small. No promises on when it'll be actually finished into an ornament though! I was soooooo happy to finish the stitching on this one this weekend! It's Peace Tree Ornament from M Designs (2004 JCS Issue). I had started it a while back, then abandoned it because of a frogging issue! I was able to finish up the stitching (frog free!) yesterday. I still have to add the beads and finish-finish it, but I'm happy with the progress! If it would not have been for the SAL weekend, who knows when I would have picked it up again!! Hey all, here are the ornies I have been stitching. 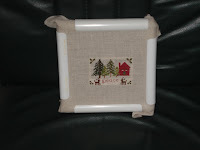 This month I stitched Pear Tree by Little House Needleworks. I really loved this one!!! This is my first ornament this year, I stitched it already last year but finished last weekend. 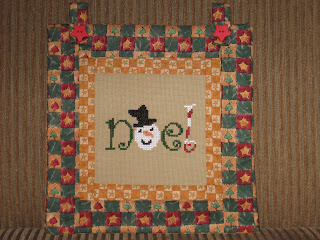 The chart is Britty Christmas Kitty by Brittercup designs and it was published in JCS Ornaments issue 2005. 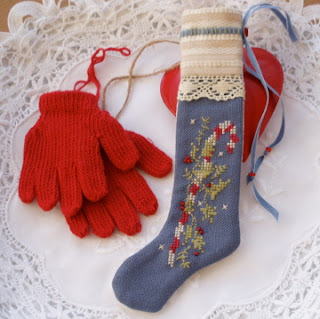 I have changed some of the threads, but can't remember what I used :) I enjoy so much seeing all the lovely ornaments in this blog! Here is my February ornament - from With My Needle JCS 2006. I have really enjoyed seeing everyone's ornaments! I can even begin to tell, how much inspiration I have received. :-) Bravo everyone! My two February ornaments. 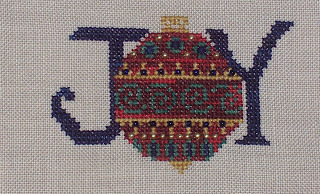 The first is joy by Erica Michael Designs from the 2004 JCS ornament issue. Completed 2/26/07. The second is star topiary ornament by Hillside Samplings from the 2000 JCS ornament issue. I need to add a mill hill treasure and it will be totally completed. All the ornaments here are so awesome, they just make me want to stitch more and more! Hi all, this is my February ornament. It´s vom JCS 1998 - The Prairie Schooler. Here's my February ornament! I didn't have a lot of stitching time this weekend so I actually finished off an ornament I started last year. 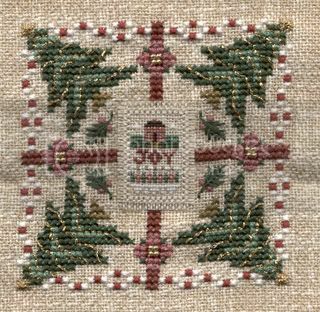 It's Fancy Work's Sampler Noel stitched on 28ct Haystack from Countrystitch with Gloriana Cranberry. The fabric it's on is what I'll use for the backing when I make it up. The original is missing 'J' from the alphabet so I added it and then had to move the rest of the letters to fit them in. All a bit fiddly! If I'd realised soon enough I could have just squashed it in on the line but I'd stitched 'H' before I spotted it and I wasn't frogging over one red silk! 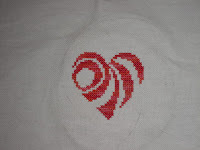 For February, I stitched this wonderful design from The Needle's Content. I had received the pattern as a gift from Barbara. I used the WDW fibers indicated on the chart. 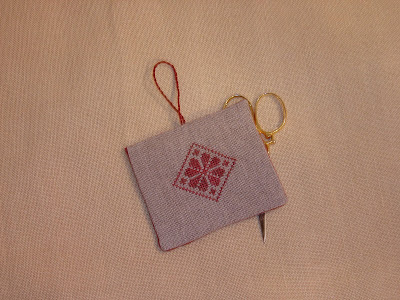 It's stitched on 28 count Desert Sand linen. There have been so many beautiful ornaments made this month! I can't wait to see more :D Here is mine, I just finished it this morning. It's Shepherd's Bush: 2000 Years Ago. There is a series of these, I think 6 in all. I had one given to me in an exchange, and so I want to complete the set, I plan on making them all this year :) This board is a great motivator to do that! This is the first time i have taken part in this sal and i have enjoyed it! I wanted to do something small, and probably will each month, to get it finished fairly quickly. It's a freebie from San-Man originals. I think i will properly finish all the christmas pieces nearer the end of the year. I love seeing what everyone has done so far! Last month, I was too busy with school and other stuff to participate in the SAL, so I got the lead out for this month! 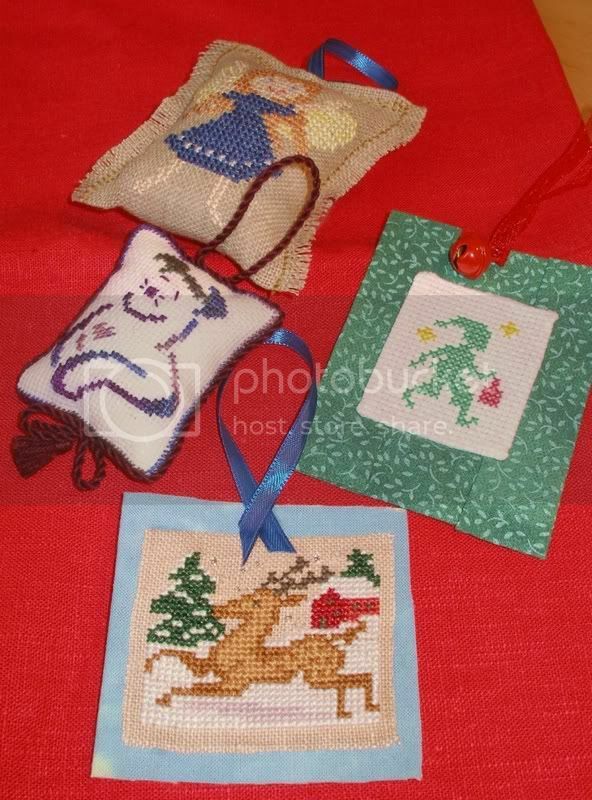 I've finished four ornaments today - three were ones I had already stitched, but not yet finished, and the little elf ornament is one I stitched and finished today. I love the little tassle for the Britty dog silhoutte, and the cording came out well, too. Yay, me! 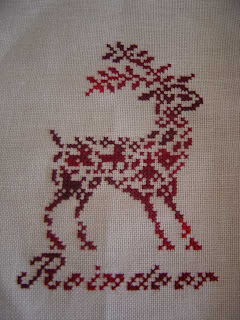 My oldest son's favorite is the reindeer from PS, finished on a hand-dyed cotton that's a soft blue/gray shade. Maybe that should be my favorite, too, as it was a no-sew finish. LOL. These are my first ornaments for this SAL. My father died in January suddenly and so I wasn't in the mood to blog. 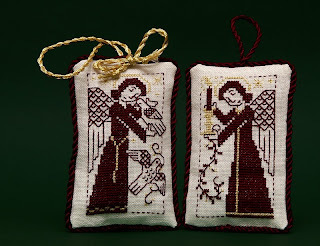 I didn't stitch an ornament this week-end, but I finished two off. 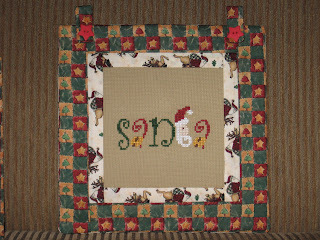 First the ornament I stitched last month: Woodland Joy by Something in Common, finished as a pinkeep. I also finished off my Peace needleroll ornament into a needleroll - but I forgot to take piccies, so I'll have to do that later. It's been pinned together for so long just waiting to have the seam stitched, I'm surprised the pins haven't gone rusty! LOL. Hi everyone, I've finished two ornaments this weekend. 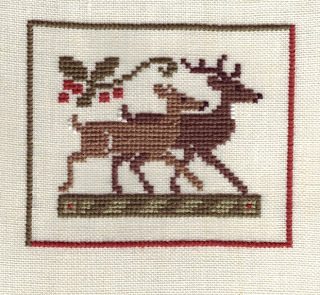 First up is JBW Design's French Country Reindeer , stitched on 28ct quaker linen using DMC 115. -sorry the pic has come out a bit dark on here, stitched on 28ct cream quaker linen with DMC threads. Here's mine for February - I still seem to be in a blue and purple mood. 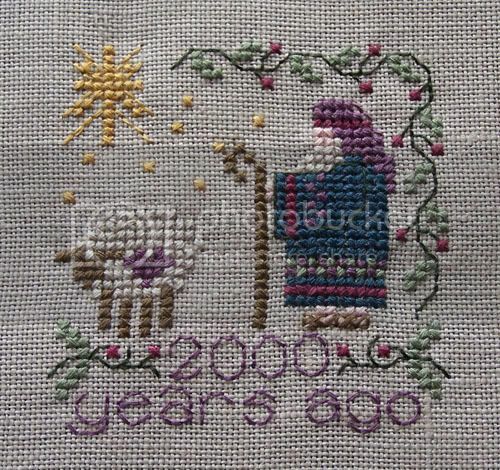 It's from the 2006 JCS Ornament issue. Instead of the recommnded colours, I used Vikki Clayton "Orb" and Waterliles "Amethyst". I still need to add a tassle, but it's stitched into a little pillow at the moment. 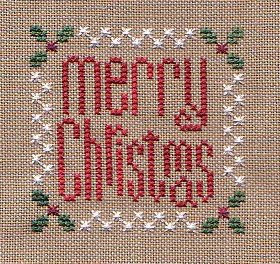 c.1998 Mary Garry's Sewing Cabin from the Just CrossStitch Ornament Magazine. I used DMC floss on 32-count Antique White linen. This is a favorite stitch of mine. In the past, I've given my ornaments away to family & friends. I got busy with this ornament a couple days early b/c our daughter was arranging a ride home [from college] this week-end. I look forward to her brief time at home. And on Monday, I'll check back here & hope to see more ornaments! This is an ornament I started in December and finished today! It's from the JCS 10th anniversary issue (06) and the designer is Little by Little Design Co. I like that you can use different color fabric. My light blue was slightly bigger than the tan and I only used one specialty thread (the star) which is all I had. Not sure is I'll embellishment this any further. Now I can finish a design from the '05 issue! I love all the ornaments you are posting as I enjoy seeing your version and how you finish them. 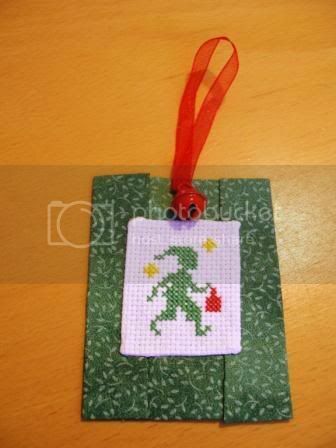 This ornament is a selection from the Ornament Round Robin I'm currently participating in. I've completed my first two ornaments ever! I'm going to try to use stuff from my stash for all my ornies this year and experiment with the finishing. I'm not a quilter or patchworker so these little efforts were a major challenge to my limited abilities. All they need now are a couple of those wire and dowel hangers and they'll be ready to use. I'm really pleased to be a part of this SAL (also a first ever) and have been impressed with the beautiful work so far, it's been very inspiring to have a go myself. The designs are worked on 28ct Summer Khaki with DMC threads and the designs are freebies from Crescent Colours. have done so far. Well, they will be ornaments. 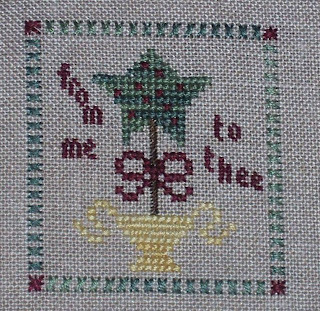 The first is Peaceful by Something in Common from JCS Ornaments 1999 and the Heart is a freebie from The Caron Collection stitched with DMC CV4200. This is my second February ornament. of the leaflet #4013 "The Christmas Collection". I have used DMC Variations 4200 for the red, 4070 for the lighter green, 4140 for the brown, and the solid 935 for the darkest green. I've also applied three Shelley's buttons. It was very quick to be stitched, and I have realized it yesterday; today I've quilted it. The back fabric is a Mumm Cozy Northwest Christmas Flannel Wildlife Silhouettes on Red Check. You can see the front and the back of the ornament. January Ornament Finish - Finally!